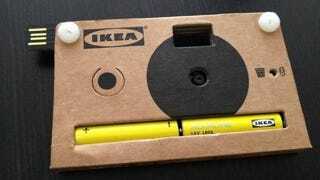 In the press kits they distributed last week at Milan's Salone design show, Ikea included a very Ikea product: a digital camera made of cardboard. The camera, which runs on two AA batteries and can hold up to 40 images on a built-in memory stick, can be synced with a computer via the USB that swings out from its side. It will soon be available for sale in Ikea stores—though, given Ikea's reputation for less than stellar merch, it might be wise to consider your options.